Horses are amazing creatures. They try so hard to please us when most of the time they have no idea what we are asking them to do. We speak to them with our words and cues and the horse struggles to guess what we are saying. The way we can help the horse understand us is by developing our own sense of feel and timing. So what is feel and timing? Feel and timing is the ability to sense the thought a horse has to do the right thing and rewarding that thought in an immediate and positive way. 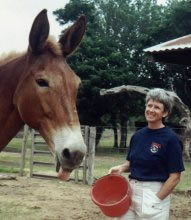 When I first started learning horsemanship I was blessed to find Linda Hoover. I was having a very hard time communicating with my mule, Tess. Tess was 17years old and I had raised her from a foal. Tess was getting more and more tight and tense and she had started to buck more frequently. When I started working with Linda, the first thing she pointed out was how braced Tess was in her body and this made it hard for Tess to move her feet in a smooth manner. When asked to move Tess would resist and then stiffly throw her body as if her body was a piece of solid wood. Linda’s goal was to teach me to help Tess move one foot at a time in a quality way. Linda worked with me and Tess patiently as we learned to communicate with each other. It turned out Tess was amazingly sensitive and her brace was a defense against my lack of feel and timing. Linda would ask me to give Tess a cue and then wait for her to respond. Linda would watch and correct me when I was late to feel Tess respond. Linda’s most often used phrase with me was “release now, oops, too late”. Eventually I was able to feel Tess shift her energy and my timing improved so I could give her the release that told her she made the right response. I would like to say I was a quick study and grasped these concepts in a timely way but in truth it took me forever. I had to unlearn so many bad habits and years of mindless interaction with Tess. In addition to my work with Linda Hoover I participated in clinics with some amazing horsemen. All of them helped me and Tess but it was the one on one time with Linda that refined my feel and timing. I was able to take individual lessons with Linda and do longer clinics. The individual lessons were especially good for me to work on my horsemanship but the clinics allowed me to build on lessons from the previous day. Watching others work on their feel and timing was also helpful for me. With the years of work I did on my feel and timing I saw Tess change from a tense, unpredictable, even dangerous mount to a relaxed, trustworthy, fun mule to ride and handle. Even in the pasture, Tess was more relaxed. She spent more time resting comfortable under the trees instead of pacing, pawing and aggravating other horses in the pasture. If you are having any problems with your relationship with your horse, consider getting some expert help with your feel and timing. Your horse will sure appreciate you more. Caring for your horse according to his own individual needs starts with having an understanding of the type he is. In the Horse Harmony book you gain an understanding of the different temperament types and how best to work with and care for each. The sequel to Horse Harmony is Horse Harmony: The Feeding Guide that goes more into the nutritional needs of each temperament type. If you are looking to gain deeper insight into the personality of your horse, how to care for him or her based on individual needs, and how to work with or just get along with your horse better, this information is for you. Here are some of the resources we have available to help you discover your horse’s temperament type and to help you establish a better relationship with your horse. This entry was posted in General Horse Care, Newsletters and tagged holistic horse care, holistic horse health, horse, horse communication, horses, talk to horses on June 1, 2016 by Madalyn Ward, DVM.